Points are an additional charge that a lender assesses in order to purchase a specified interest rate. A point is a percentage of the loan amount, or 1-point = 1% of the loan, so one point on a $100,000 loan is $1,000. Points, often referred to as “Discount Points”, are fees used to lower the interest rate on a mortgage loan by paying some of this interest up-front. Lenders may refer to costs in terms of basis points in hundredths of a percent, 100 basis points = 1 point, or 1% of the loan amount. The most important thing to understand is that the lender is charging you an additional fee to obtain the rate you’re being quoted, and there likely is a higher fee that the lender could give you without charging you the extra money. Paying points is not always the most financially sound option. How is your Payment Calculated? Payments are generally comprised of four components: (1) the principal and interest payment, (2) property taxes, (3) homeowner’s insurance and (4) mortgage insurance. The Principal & Interest payment (or the P&I payment as it’s sometimes called) is the loan payment. It’s determined by the amount of money you borrower, interest rate and term of your loan. Property taxes are set by the county the home is in and gets broken down to a monthly payment that you pay as a part of your monthly payment. The same goes for homeowner’s insurance; that is an insurance policy y you’ll shop for once you find a home. The first year’s premium is due at closing, but the subsequent years are paid through your escrow account that the mortgage lender holds for you. 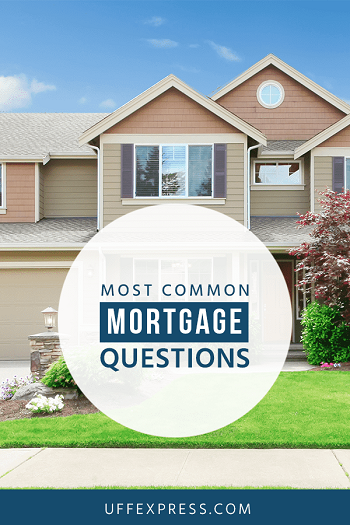 Mortgage insurance varies by loan program and is either set by the program itself (like for FHA and USDA loans), or it’s set by Private Mortgage Insurance companies (like PMI on a Conventional loan). For better help, check out our mortgage payment calculator or our specific calculators for Florida, Texas and California. Which Loan Program is Best? Most borrowers don’t know the various loan programs well, as that’s what a trusted loan officer is for. With that in mind, it’s the loan officers’ job to explain the pros and cons of each loan program to ensure you know which option best suites your needs. For a better overview, and to determine which program may best suite you, check out our detailed breakdown of home loans and your options. Paying discount points to lower the loan's interest rate is a good way to lower your required monthly loan payment, and possibly increase the loan amount that you can afford to borrow. However, if you plan to stay in the property for only a year or two, your monthly savings may not be enough to recoup the cost of the discount points that you paid up-front. The determining factor is analyzing how much the points are costing you and how much you’re saving on your payment. For example, if it costs you $1,000 to lower your payment $10/moth, that is a 100-month return on investment (or a little over 8 years). In that instance, the rate with no points makes the most sense for the first 8 years whereas the rate with points only benefits you if you stay in the home (and the loan) for 8 years. Given that the average American refinances or sells their home every 4-5 years, any recoupment period longer than that is likely a losing scenario. The annual percentage rate (APR) is an interest rate reflecting the cost of a mortgage as a yearly rate. This rate is likely to be higher than the stated note rate or advertised rate on the mortgage, because it considers points, some of the title fees, and other costs. The APR allows homebuyers to compare different types of mortgages based on the annual cost for each loan. The APR is designed to measure the "true cost of a loan." It creates a level playing field for lenders and is supposed to prevent lenders from advertising a low rate and hiding fees. Because APR calculations are affected by the various fees charged by lenders, a loan with a lower APR is not necessarily a better rate. The best way to compare loans and lenders is simply to compare 3 items: the interest rate, the origination (and any processing/underwriting fees) and the discount points being charged for the rate. All other fees (appraisal, credit report, title fees, etc.) will be the same between lenders…the loan and loan fees are the ones that truly matter. The lender that has lower loan fees has a cheaper loan than the lender with higher loan fees. Mortgage rates change from the day you apply for a loan to the day you close the transaction. If interest rates rise sharply during the application process it can increase the borrower’s mortgage payment unexpectedly. Therefore, a lender can allow the borrower to "lock-in" the loan’s interest rate guaranteeing that rate for a specified time period, often 30-60 days. The rate on a purchase will generally occur once the borrower is under contract for a home. The rate lock on a refinance will generally occur once the borrower has indicated their intent to proceed and agreed to move forward with the loan. Due to the sensitivity of the interest rate environment, it’s very important that you close before your rate lock expires. Failure to do so will likely result in additional extension fees added to extend your rate lock agreement. Below is a list of documents that are required when you apply for a mortgage. However, every situation is unique, and you may be required to provide additional documentation. Credit scores and credit history play a large role in determining if you qualify. Not only do most mortgage programs have minimum credit score requirements, but the credit score itself determines the interest rates lender can offer you. Mortgage lenders pull all 3 credit scores from Equifax, TransUnion and Experian, and they will use the middle of the 3 scores when it comes to determining your interest rate and qualification. Keeping credit card balances low, making payments on time, and limiting the number of credit inquiries all play a large part in having a good FICO score. There are different credit score models and scores that FICO generates. Sites like Credit Karma or various credit monitoring services use the FICO 8 model, whereas mortgage lenders use FICO 2 or 5. Therefore, the score mortgage lenders obtain are likely lower than what you will see through a typical credit monitoring service. The most widely used credit scores are FICO scores, which were developed by Fair Isaac Company, Inc. Your score will fall between 350 (high risk) and 850 (low risk). Credit scoring models are complex and often vary among creditors and for different types of credit. If one factor changes, your score may change -- but improvement generally depends on how that factor relates to other factors considered by the model. Have you paid your bills on time? Payment history is a significant factor. It is likely that your score will be affected negatively if you have paid bills late, had an account referred to collections, or declared bankruptcy. What is your outstanding debt? Many scoring models evaluate the amount of debt you have compared to your credit limits, particularly on revolving debt such as credit cards are home equity lines of credit. If the amount you owe is close to your credit limit, that is likely to have a negative effect on your score. Ideally, for you to boost your scores the most, focus on keeping your credit card balances 30% or less of the available credit limit. How long is your credit history? Generally, models consider the length of your credit history, so having accounts open for a longer period helps. With that in mind, if you pay off a credit card be sure to keep it open and use it occasionally (once/month is fine). Closing out accounts entirely can have a negative impact on your score. Have you applied for new credit recently? Many scoring models consider whether you have applied for credit recently by looking at "inquiries" on your credit report when you apply for credit. If you have applied for too many new accounts, that may negatively affect your score. How many and what types of credit accounts do you have? Although it is generally good to have established credit accounts, too many credit card accounts may have a negative effect on your score. To improve your credit score under most models, concentrate on paying your bills on time, paying down outstanding balances, and not taking on new debt. Appraisals are ordered through your lender and it’s not something you set up on your own. There are instances where an appraisal can be transferred from one lender to another, which can be helpful if your loan gets declined somewhere or if you find out you’re not being offered a fair rate. Generally closing will take place at the title company or law firm, these are typically called the “settlement agents”. At closing, the ownership of the property is officially transferred from the seller to you. This may involve you, the seller, real estate agents, your attorney, the lender’s attorney, title or escrow firm representatives, clerks, secretaries, and other staff. Any reduction in your interest rate can trim your monthly mortgage payments. Whether or not it makes financial sense to refinance comes down to the math. On a typical rate/term refinance where the borrower is no looking to cash out any equity, a refinance becomes an ROI calculation: how much will you save in interest per month compared to the cost of the refinance. Generally, you want to recoup all costs within 3-4 years. If you carry credit card debt, it may make sense to refinance your mortgage even if you’re increasing your interest rate. 20% interest on $20,000 worth of credit card debt is $4,000/year in lost interest payments. If you owe $150,000 on your home with a rate of 4%, and a cash out refinance would increase that rate to 4.500%, that means it’ll cost you $750/year in additional interest. Therefore, you only lose $750/year on the mortgage interest, but you save $4,000/year on credit card interest. So even though the rate of your mortgage may increase, there are a lot of scenarios where it makes financial sense to do so.